Wednesday May 24th. Chips Away. 15 miles. Leaders: Dave and Alma Walsh. Bad planning by the Walks Secretary had us leading our second walk in four days. Nevertheless 21 of us including new member Robert, & a small contingent from West Lancs, set off from Chipping Car Park on a dull but warm day. Sorry, not to forget our canine pals Maude & Maisy. In the second field we encountered some lively cows & a bull, walking poles were at the ready but not needed (why do these beasts always congregate by the gate/stile?). We carried on undeterred and across pleasant fields we sighted a deer, then up a quiet country lane to our morning coffee stop at Bleasdale Church. After our break we continued to Brooks Barn where we turned South West passing the impressive Bleasdale Tower. Several more fields were crossed until we hit a quiet lane which led us to our lunch stop by the River Brock. After lunch a brief climb up the road took us to the edge of Beacon Fell Country Park. We climbed up a steep hill to the Visitor Centre for a short stop. From there, quiet lanes & fields took us back to the same field again for another encounter with the skittish cows & bull, this time by our exit stile & then back to Chipping. A number of us finished the day in the pub for a quick drink before driving home in the sunshine, it had finally come out. Thanks to all of those who turned out. Sunday May 21st. Todmorden Trot. 22 miles. Leaders: Dave and Alma Walsh. 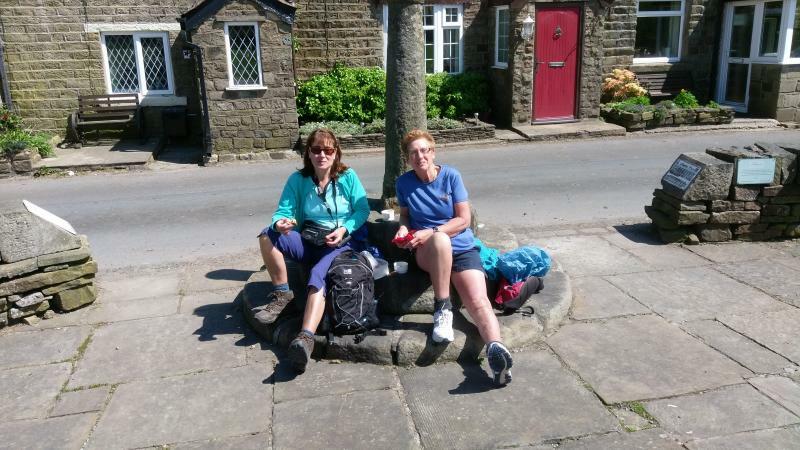 Sixteen of us gathered at Todmorden for this walk, including two ladies from Bolton Ramblers who had not walked this distance before & were in training for a big charity walk, & a couple of 100 walkers on their last outing before the big event. We started with a gentle walk along the canal before a stiff climb took us up onto the moor. We made our way up to the trig point at Trough Edge End. After a brief catch up we made our way in a North Westerly direction before taking a morning break just before the Bacup road. After crossing the road we followed a track through a farmyard (unfortunately the tiny piglets we had seen on the recce two weeks before were nowhere to be seen) before joining the Burnley Way which took us up to Thieveley Pike. 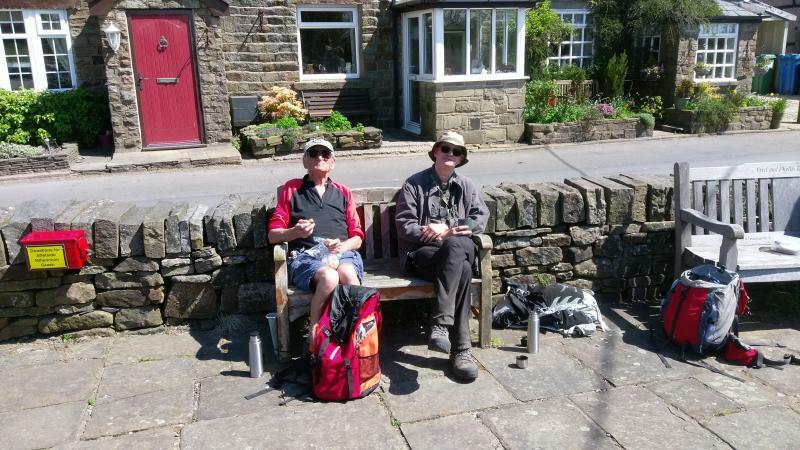 After dropping down from the Pike we continued in the same direction until we turned back on ourselves at the Bacup to Burnley road & picked up the Pennine Bridleway which led us to our lunchstop by a stream. We were 10.5 miles into the walk. After lunch & a sighting of the Singing Ringing Tree in the distance, we crossed the Burnley to Todmorden road & followed a quiet road uphill to Overtown. From there we picked up the Burnley Way for quite a way before picking up a track over fields towards Holme Chapel. We then turned & made our way south of the Wind Farm which dropped us down into the Cornholme area of Todmorden. One further stiff climb took us up again before making our way down into Todmorden & through Centre Vale Park back to the cars. A little over 21 miles with about 3000 ft of ascent & good weather conditions. Thanks to all who attended. Click here to see Ken's pictures. Click here to see Howard's pictures. Wednesday May 10th. Red Rose 50 Part 1. 14 miles. Leaders: Norman Thomas, Chris Langabeer & Ian Pickup. 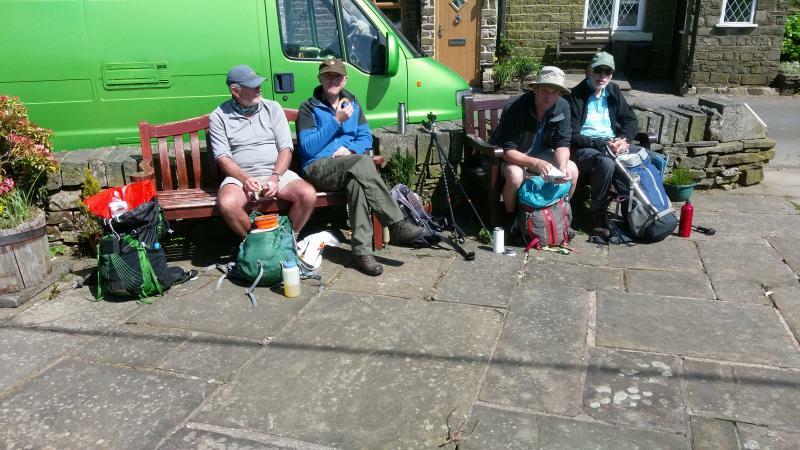 A group of 18 walkers and 1 dog (Maude) assembled on the car park at White Coppice cricket club to take the coach to Horrobin Lane; from where it was only a short distance to the start point of the walk outside of Jumbles sailing club. 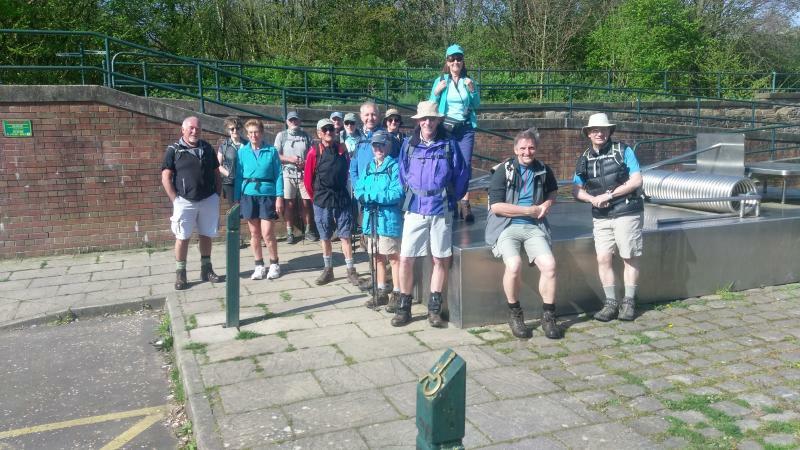 After a photograph and a short address from Norman the group set off in warm, sunny weather towards Turton Tower. From there the Witton Weavers Way was taken for the first ascent of the day to Cheetham Close (329m) where another photo opportunity presented itself at the trig point. A level section followed until, just before Turton Heights, a left turn was taken to descend towards Dimple and the A666 (Blackburn Road). On crossing the A666 the route by-passed Delph reservoir, passing through a wooded area where there was a disused quarry. It was here that a somewhat belated coffee stop was taken. 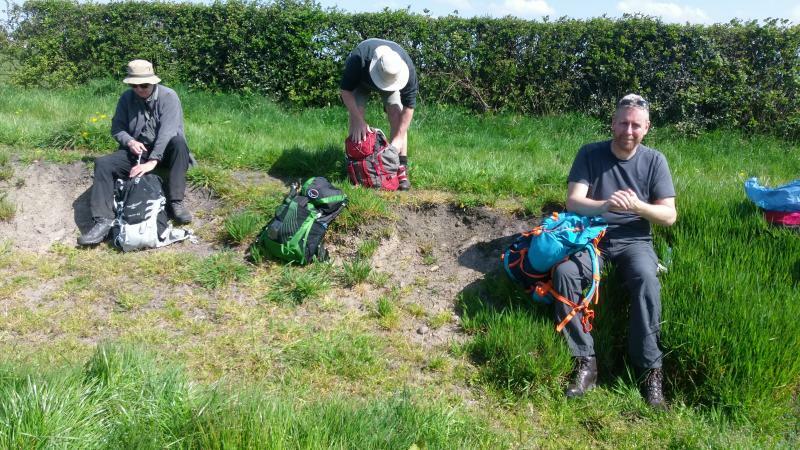 Shortly afterwards, on meeting a minor road, the walk departed from the Witton Weavers Way. Here there was a discrepancy between the route being followed by the leaders (taken from the gpx-file downloaded from the East Lancs website) and that devised by the main organiser of the Red Rose 50. However, a couple of narrow roads were taken to lead past the mast on Great Robert Hill, before descending past the Ornamental reservoir (referred to by Norman as the ‘Monumental reservoir’!) and crossing the A675 at the top of the hill above Belmont village. Next came the long gradual ascent to the summit of Winter Hill during which time two additional walkers joined us. Lunch was taken here where there was plenty of suitable seating for the whole group to enjoy a break in lovely, sunny weather – a contrast to the very strong wind encountered on the reccie a week earlier. After lunch the tarmac road was followed initially before branching off past Crooked Edge Hill to descend to Pike Cottage. Next came Rivington Pike for the third (and final) significant ascent of the day. 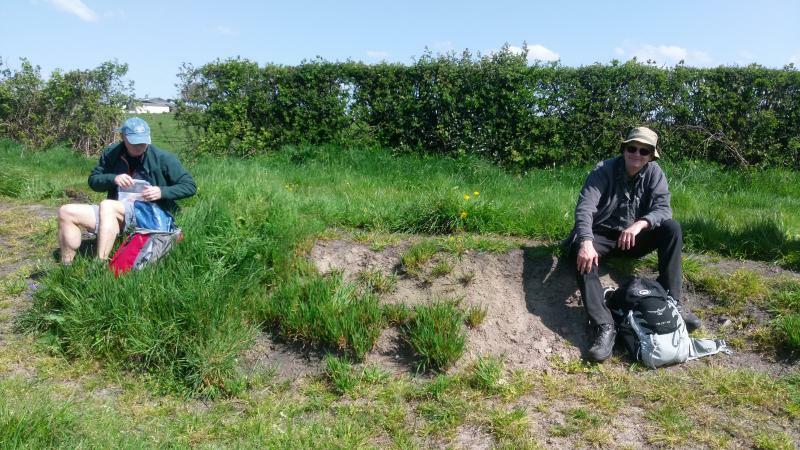 ‘Rolling a marble to the finish’ was mentioned for the first time as the walk descended the steps from the Pike to proceed to Rivington Hall Barn and reach Rivington village! Here, at the Rivington Club, ice creams of various exotic flavours were purchased by the majority of the group. With some 3.5 miles remaining the route followed the reservoirs of Upper Rivington, Yarrow, Anglezarke and High Bullough in turn. Finally the last mile followed the Goit to White Coppice and the cars. Overall, just over 14 miles completed on a superb day for walking. ‘Failure is not an option’ was never mentioned on this occasion! Afterwards a number of the group retired to the Malthouse Farm PH at Whittle-le-Woods for a pleasant post-walk drink in the sunshine. Norman, Chris and myself hope that everybody enjoyed the day and we look forward to Part 2 on 14th June when we will meet for the coach at the Clog & Billycock PH at 9.00am. Sunday May 7th. High Street Stroll. 31 miles. Leaders: Alf Short and Jean Lyon. At 32mls and 10,000ft of ascent (post walk GPS readings) the 'stroll' was even more challenging than advertised. But what a glorious day out for the six intrepid souls who set out from Ambleside at just after 8am: these being, the walk leaders Alf Short & Jean Lyon (East Lancs); Brian Fisher - the official photographer & Cath Percival (West Lancs); and Anne Webb & Hazel Storozuk (South Pennines). With a good weather forecast it was dry, but nippy, as we trundled across to Troutbeck via Jenkin Crag; then up the Garburn Road. We then made a (deliberate) scenic diversion. The normal route from here is a descent to Kentmere, followed by a steady climb up the valley to reach the Nan Bield Pass shelter. Instead, we took the much more interesting western side of the Kentmere Horseshoe, taking in Yoke, Ill Bell and Froswick, then skirting past Mardale Ill Bell as we headed around the head of the valley, and dropped down to the shelter. By now we were in mist and it was quite cold. Before climbing into the mist we could see that High Street was covered in a thick blanket of cloud. A quick butty stop, followed by the climb up Harter Fell, before dropping down (and out of the mist) to the Gatesgarth Pass. From here a steepish climb along the fence line to the Selside cairn via Branstree. A sharp right and a grassy descent into Swindale swinging left to the farm buildings at Swindale Head. From here came a steep climb up the Old Corpse Road levelling off for the path across to Haweswater. (The Old Corpse Road was used until 1729 to carry corpses from Mardale Green - now covered by Haweswater, to Shap for burial). A second and final butty stop just before reaching the road at Haweswater. Along the road to Mardale Head and a big disappointment - no ice cream van! But life goes on and we swung round the reservoir for the strenuous climb of Kidsty Pike and on to High Street - now cloud free. We stopped at the trig point for the obligatory photos, before swinging around to the Beacon. Very great care was needed for the treacherous descent leading to the pleasant climb, more like a scramble, of Stony Cove Pike. From here it was easy going for the final descent to the pub (closed) at Kirkstone Pass and then down the struggle and back to the Ambleside car park and home. Overall the weather was kind, and this wonderful walk in good company was a day which was as good as it gets. 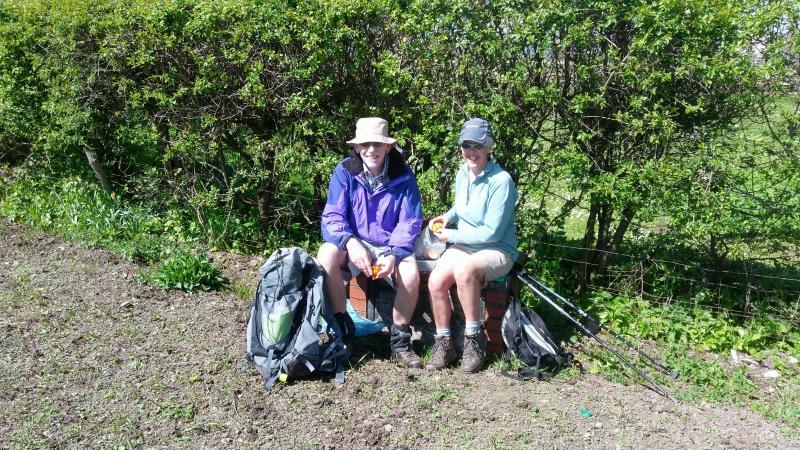 Please click on the link below to see the wonderful pictures of this walk from Brian Fisher. Click here for Brian's pictures. Wednesday May 3rd. Stolen from the Scouts. Plodder Walk. 15 miles. Leader: John Thompson. 15 plodders set out from the mouse trap at Burrs park on a very sunny but windy day. Across Bury to Elton res & Higher Spen Moor then Pilkington Fold farm for our morning break. From here to Cockey Moor & old Barn Farm, the Bentley Hall Rd & Bowstone Hill joining the Roman Rd to Affetside where we stopped for lunch in the gardens around the Roman Cross. On then to Buckley Close farm & Two Brooks farm where we lost one of our flock (Pete B). After he returned to the flock we crossed the rd at Hawkshaw and climbed up to Higher House farm turning right to cross the army camp. Onwards to Simons farm then left and across a stream we had three short easy climbs (we wish) to the track around Holcombe Hill (missing out the tower). We then turned right down to Holcombe Old rd & passing the Hare & Hounds crossed the main rd. From here to Woodhey & Summerseat garden centre, stopping for a tea break. On then past Summerseat station & across the railway line then right along the track to Bank Top farm. It was just past this point that we heard a whistle, going back we found John P had fallen down but Viv & Barbara had him on his feet in no time (thankfully he had only cut his arm). John u must stop your break dancing as you don't bounce like you used to. It was then a short walk to the car park & the end of a great day. A few of us tried out the Brown Cow for a cold beer, good company & lots of laughs. Thanks to all who came and had fun in the sun.